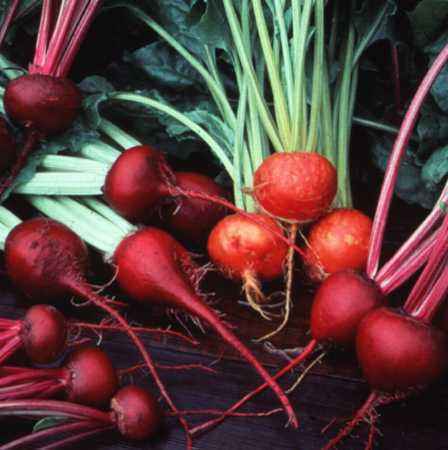 Growing Beets is easy and virtually the entire plant can be eaten. Beets can be grown for their root, which include different sizes as well as red, yellow or white colors. The greens, when young, are outstanding in salads and when the plant is older, can be cooked. The greens are even more nutritious than the roots. Diseases: Leaf spot has brown spots ringed in purple, and is a result of cold wet soils. It's best plant when soil temperature is at least 65 degrees. 'Chioggia' - a sweet-tasting Italian heirloom with red- and white-striped flesh. 'Detroit Dark Red' - a popular deep red, round variety that grows 21/2- to 3-inches in diameter. It grows well in a wide range of soil and temperature conditions. Very adaptable. 'Golden' – this variety has carrot-colored roots. and they don't "bleed." 'Little Ball' – known as baby beets. 'Lutz Green Leaf' - this variety grows up to four times the size of most beets, but has one of the sweetest tastes when harvested early. It's a good winter keeper. 'Ruby Queen' – standard red variety. 'Winterkeeper' – can be when harvested early and a good winter keeper.